Making a list of how to green your holidays? Here are some of our favorite tips and events to cure the post-holiday blues. Whether you're hosting a gathering or just giving and receiving, clearing out excess can make for a more sustainable holiday season. Find new homes for unwanted items through clothing collections, coat drives, Stop 'N' Swap® events, holiday toy drives, or DonateNYC reuse partners--you'll have more room to celebrate, and an easier time recycling and reusing your post-holiday waste. Try e-cards or look for greetings made with recycled content (the more post-consumer content, the better). Show some style when shopping by bringing your own reusable bags. Choose minimally-packaged items made with recycled content and give items that will be treasured, not thrown out before the next holiday season. Consider giving experiences, homemade, and vintage gifts. Find new joy in old favorites that are broken or need refreshing with Fixers Collective. Get hundreds of toy-free gift ideas for a more meaningful holiday here and here. Remember to wrap it recyclable by using old newspaper, paper gift wrap, paper gift bags, or reusable bags and containers that keep on giving all year. Look for items in recyclable packaging and buy minimally- or non-packaged fresh produce, like that from Greenmarket. Get meal planning and food storage tips from Save the Food, and read a thorough overview of sustainable Thanksgiving meal planning. Easily compost vegetable trimmings by using drop-offs at select Greenmarkets and other locations. Serve your masterpiece on reusable plates and offer guests reusable flatware, glassware, and napkins. Prevent waste by making small changes such as using recyclable aluminum foil rather than plastic wrap for food storage. Stuck with clean up duties? Wrapping paper, gift boxes, cardboard, and other paper packaging can go out with other paper recycling (remove tape, ribbons, and other decorations). Eggnog cartons, wine bottles, olive containers, cookie tins, and hard-to-open rigid plastic packaging are easy to recycle alongside the rest of your metal, glass, plastic, and cartons. If your curbside recycling day falls on Christmas and New Year's Day, here's when to set out recycling, garbage, and organics (if participating). Foam peanut packaging and plastic foam blocks are not recyclable, but alternative paper packaging can be included in your recycling pile. Foam peanuts can be reused at select shipping centers and Manhattan Mailroom locations, and cornstarch peanuts can be composted. For those so inclined, even corks can be recycled—find drop-sites here. Save take-out containers to send guests home with another helping. Check the shelf life of open and unopened food and get storage tips to make the most of food and create less waste at stilltasty.com. If you're putting up a real tree for the holidays, plan to chip in at MulchFest! Trees (cleaned of stands, lights, tinsel and ornaments) will be collected and recycled into mulch for NYC parks at designated sites from January 4-13. Bring your own bag to select sites on January 12 & 13, and take home mulch for your yard, garden or street tree. 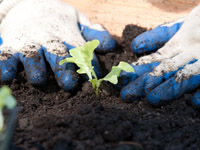 Find citywide drop-off sites and mulch pick-up locations here. If you miss MulchFest, the city will pick up trees (also stripped of ornaments, etc) curbside from Jan 2-12, barring any snow disruptions. Certain electronics are banned from disposal. When upgrading or unloading electronics, many recycling options are available at no cost, including curbside pickup for homes in Staten Island, Brooklyn, and Queens West. 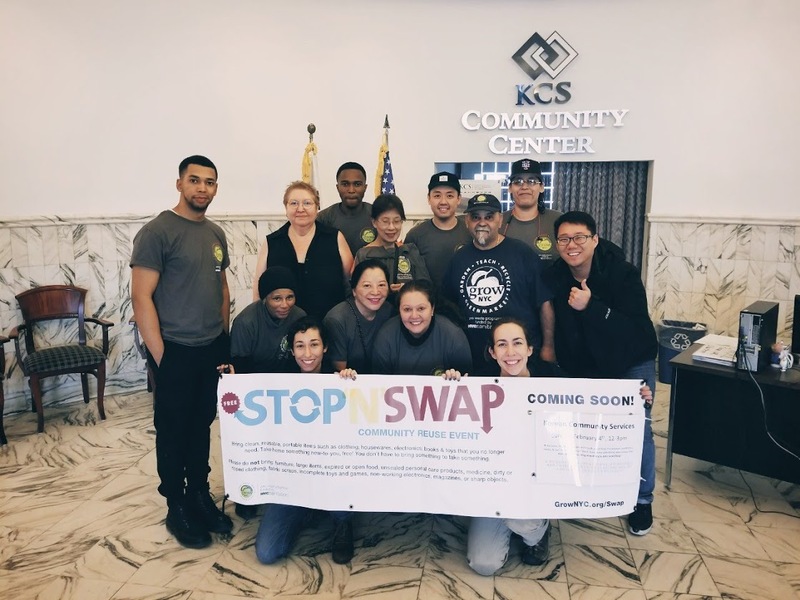 Find more recycling resources here and check in with the Lower East Side Ecology Center, which runs the Gowanus E-Waste Warehouse in Brooklyn and hosts "After the Holidays" e-waste collections in all five boroughs. Clear out ill-fitting, outdated and otherwise unwanted clothing, shoes, and linens and bring them to one of GrowNYC's weekly collections for reusable clothing and other textiles. GrowNYC's Stop 'N' Swap® is the ultimate re-gifting party. Bring reusable items to share (portable items only) or simply bring a tote bag or two to take home things you can put to reuse. Unstuff your home at one of 4 swaps in December, or find winter swap dates and locations at GrowNYC.org/swap. From all of us at GrowNYC, thank you for helping green our city by taking our "recycling challenge" at community events, volunteering as an Environmental Ambassador, dropping off clothing and food scraps at our Greenmarkets, attending our Stop 'N' Swaps, and more throughout 2018. We look forward to seeing you out at many of the great recycling events that will kick off a sustainable 2019. Happy Holidays! For more tips on keeping your holidays green and merry, visit the NYC ZeroWaste page. Wrapping paper, gift boxes, cardboard and other paper packaging can go out with other paper recycling (remove tape, ribbons and other decorations). Eggnog cartons, wine bottles, olive containers, cookie tins and hard-to-open rigid plastic packaging are easy to recycle alongside the rest of your metal, glass, plastic and cartons. Block Styrofoam and foam peanut packaging are not recyclable, but alternative paper packaging can be included in your recycling pile. Styrofoam peanuts can be reused, and cornstarch peanuts can be composted. For those so inclined, even corks can be recycled--find drop-sites here. Visit our Holiday Tips page for post-holiday tree collections, electronics recycling events and community swap events. Five Million Hi-Fives to Greenmarket Composters! Spring, winter, summer or fall, New Yorkers are increasingly dedicated to building a collective compost pile, facilitated by Greenmarkets and community composters throughout the city. In partnership with the NYC Department of Sanitation, GrowNYC has diverted more than 5 million pounds of residential food scraps from disposal. Material dropped off at Greenmarkets is distributed to a network of local compost sites, such as Earth Matter on Governor’s Island, where chickens get the first “peck” of the scraps, and Red Hook Farm, where unwanted scraps are transformed to nurture a new crop of Brooklyn-grown vegetables. Whether your haul is large or small, we thank YOU for your contributions to this effort! 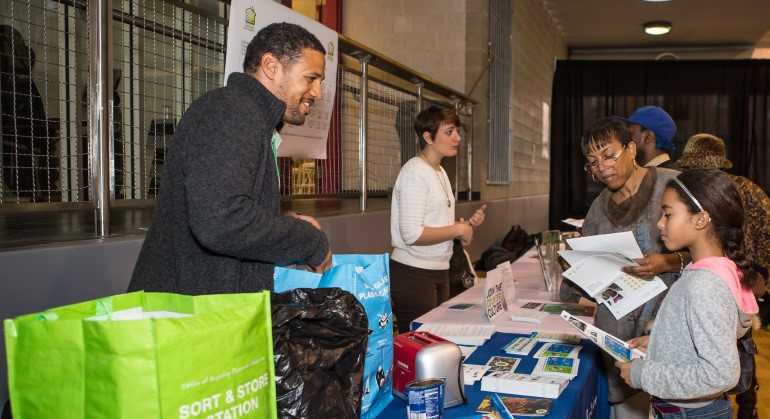 Learn more about food scrap collections at Greenmarket. Read more about Five Million Hi-Fives to Greenmarket Composters! Read more about #GivingTuesday is almost here!